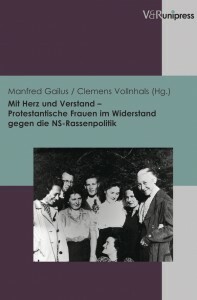 Review of Manfred Gailus and Clemens Vollnhals, eds, Mit Herz und Verstand—Protestantische Frauen im Widerstand gegen die NS-Rassenpolitik (Göttingen: V&Runipress, 2013). Pp 280, with illustrations. ISBN: 9783847101734. The history of the Protestant women involved in resistance against the Nazi regime is well-documented, but it remains under-examined in the broader literature about the German Church Struggle and the resistance movements. Manfred Gailus, a contributing editor to this journal and co-editor of the book under review here, has devoted much of his recent work to correcting this. Mit Herz und Verstand is one of his recent additions to the literature. In addition to the fine overview of the topic in the introduction by Gailus and co-editor Clemens Vollnhals, it consists of biographical and historical profiles of Agnes and Elisabet von Harnack, Elisabeth Abegg, Elisabeth Schmitz, Elisabeth Schiemann, Margarete Meusel, Katharina Staritz, Agnes Wendland and her daughters Ruth and Angelika, Helene Jacobs, Sophie Benfey-Kunert, Elisabeth von Thadden, and Ina Gschlössl. Only a few of these women are recognizable names (notably Agnes von Zahn-Harnack, but usually in conjunction with her more famous father, theologian Adolf von Harnack), yet even a brief description of who they were and what they did illustrates why their stories are deserving of greater scholarly attention. In addition to achieving their doctorates, both Harnack sisters were active feminists during the 1920s. Agnes von Zahn-Harnack (who held a doctorate in Germanistics and philosophy) helped found the Deutsche Akademikerinnenbund and became the chairwoman for the Bund Deutscher Frauenvereine, and Elisabet von Harnack (who had studied political economics and church dogmatics) was a leader on women’s issues and school reform. Elisabeth Abegg was a Quaker who had worked with Friedrich Siegmund-Schultze during the 1930s and helped hide almost 80 Jews during the Nazi era (for which she has been honored by Yad Vashem). Abegg taught at the Luisenschule, a Gymnasium for young women in Berlin when Elisabeth Schmitz also taught. Schmitz of course was the author of the 1935 memorandum to Confessing Church leaders urging them to speak out in solidarity with the persecuted Jews; she subsequently resigned her teaching position in protest after the November 1938 pogroms. Elisabeth Schiemann was one of the first German women to attain a doctorate in botany and genetics, published several well-received studies and was affiliated with Friedrich-Wilhelms University and the Botanical Museum in Berlin. She joined the Confessing Church in 1934 (she was a member of the Dahlem parish) and became one of its most vocal members, writing letters to Martin Niemoeller urging him to speak out more forcefully. She personally delivered Elisabeth Schmitz’s memorandum to Karl Barth in Basel, and Franz Hildenbrandt used excerpts from a 1936 memorandum written by Schiemann in the 1937 statement on the Jews that he submitted to the 1937 Confessing synod (he acknowledged her text). While we now know that Elisabeth Schmitz was the author of the famous 1935 memorandum, Margarete Meusel (to whom it had been attributed) wrote a similar memorandum and worked throughout the Nazi era helping and hiding “non-Aryan Christians” and Jews. Katharina Staritz, a Confessing Church theologian of Jewish descent who worked with the Grüber office, is known for her protest against the Breslau church authorities’ decision to bar people wearing the yellow star from the churches—for which she immediately lost her job. With no cover from the church, she became the target of Nazi propaganda and ended up in the Ravensbrück concentration camp. Agnes Wendland, wife of a Confessing Church pastor in Berlin, hid several Jews in their parsonage and was helped by her daughters Ruth and Angelika. Helene Jacobs was one of the few Germans to make no compromises with the regime, beginning with her refusal in 1933 to fill out the Aryan certificate for university study and ending with her participation in the Kaufmann resistance circle that forged false documents for Jews and helped them escape (Jacobs, too, spent the final war years in Nazi prisons). Sophie Benfey-Kunert was a staunch feminist who became the first woman in Hamburg to take the theological exams; she was chaplain in a women’s prison before she married Bruno Benfey. Benfey, one of the “non-Aryan” pastors in the Hannover church, became the target of Nazi propaganda and found no support from Bishop August Marahrens; the Benfeys finally emigrated to the Netherlands in 1939 and returned to Göttingen after 1945. Elisabeth von Thadden founded a small private school that continued to accept Jewish students until the regime took it over in 1941; she then became involved in various resistance activities and was arrested in early 1944. She was beheaded in the Plötzensee prison in September 1944. Ina Gschlössl, who founded the Association of Protestant Women Theologians in 1925, was fired from her teaching job as a religious educator in 1933 after making critical remarks about Hitler; she eventually worked for the Confessing Church’s Inner Mission. The story of each woman is important in its own right, but the real value of this volume is that the essays go beyond the biographical, portraying the women in a broader historical context that records both their significant achievements before 1933 and the scandalous treatment of them after 1933, particularly within the church. It also includes the post-1945 period, which shows that their contributions were largely forgotten and dismissed. This volume illustrates why the study of these women offers some important correctives to our general understanding of the larger issues in the German churches, the emergence and nature of different resistance movements, and the early postwar dynamics. It is impossible to understand these women separately from the historical, social, and political context of early twentieth century Germany. They were among the first generation of women in western societies (not only in Germany) to mobilize politically, study for advanced degrees, and enter traditionally male professions. The social shifts of the Weimar years opened the way for them to enter the political sphere in Germany; almost 7 percent of the Reichstag representatives in 1926, for example, were women. Their stories show how very different the experiences of these women were from the young men in their generation. This is especially evident in the essay on Agnes von Zahn-Harnack. During the 1920s she published and spoke widely on the women’s movement; organized German academic women and was the German delegate to the meetings in Amsterdam and Geneva of the International Federation of University Women and was elected to its board. In that international context she became one of the leading German voices on the “peace question.” The accounts in this volume of their various activities throughout the 1920s reveal a “Who’s Who” of early German feminist leaders. Thus, although many of the women studied here sought careers or were active in the German Evangelical Church, they also shared a history of feminist and political activism in the interwar period. A number of them (both Harnack sisters, Abegg, Schmitz, Wendland, and von Thadden) had worked in Friedrich Siegmund-Schultze’s social ministry in east Berlin during the 1920s. Others were involved in early German feminist organizations like the Bund Deutscher Frauenverein (which Agnes von Zahn-Harnack led) and the religious socialist movement. In each of these three organizations, they had contact with Catholics and Jews, which was a factor in their active help for Jewish friends and colleagues after 1933. By looking at the culture and perspective of German feminism throughout this era, this volume makes an important contribution that goes beyond simply documenting the role played by these women. There continues to be a gendered division of history that runs through most of the literature on the Protestant Kirchenkampf, including the numerous books about Dietrich Bonhoeffer. (For those readers who are wondering, Bonhoeffer made no reference to the ordination debates and related feminist issues and showed no public solidarity with the Confessing Church women, despite the fact that he had taught several of them in Berlin and his close friend Elisabeth Zinn was among them.) The integration of these women’s lives into the scholarship could give us some new perspectives on the internal church debates. By portraying their political clarity and courage, particularly with regard to the persecution of Jews, this volume illustrates that there were people in the Confessing Church who stood up to the Nazi regime when it counted—many of them were women. The views expressed in this review are those of the author and do not necessarily represent those of the United States Holocaust Memorial Museum or any other organization.